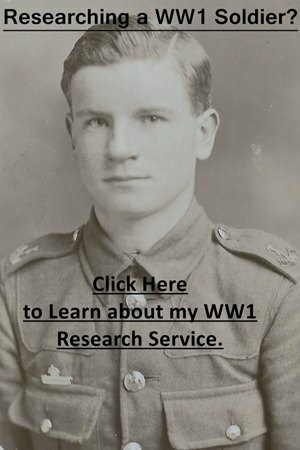 This guide into using newspapers to research a soldier who served in the First World War is designed to enable you to add more information about the units they served with. This article is one of my Guides to Researching Soldiers who served in the British Army during WW1. One of the most important resources you can use to research a soldier is contemporary newspapers. I have already written an article on using newspapers to find specific information about a soldier, their death, award of a gallantry medal, etc: Using WW1 Newspapers to Research a Soldier. This article will help you to find more information about a soldier’s unit, or theatre of war, and likely experiences. First-hand accounts were in great demand during the course of the war, and many soldier’s letters were published in newspapers. These are fantastic resources if you can find a letter written by a soldier of the same unit. Clicking on the link below will take you to FindmyPast and they usually have a free 14 day trial, giving you plenty of time to search their newspapers. Your first step should be to search newspapers which have been digitized. The best approach is to try a combination of key words. Unit: Newspapers vary how they record a unit; e.g. one newspaper will use 4th Royal Scots, another 4th Battalion Royal Scots. So vary your search term. Goods words to try are writes, letter, parents, etc. in combination with a unit title. Add in a specific event: Chocolate Hill, Gallipoli, Hill 60, etc. Key dates to look for letters published are shortly after a unit arrived abroad, or when they were heavily engaged. If you haven’t managed to find any information by searching all of the newspapers, you can use my guide below to find relevant digitized newspapers and look through them, though this will take some time. Hopefully, you already know which unit a soldier served in. The next step is to learn the basic background of a unit to find out where the majority of soldiers were from. N.B. Some units recruited far and wide and this approach won’t help you. I’m looking for Private John Smith, whom I know served in the 6th Battalion North Staffordshire Regiment. The 6th Battalion was a Territorial Force battalion, which initially recruited its soldiers from a very localised area. My next step would be to use The Territorials a Guide for Military and Family Historians by Ray Westlake, to find out where the companies were based. The headquarters of the battalion and a company were based at Burton-on-Trent, with additional companies at Longton, Hanley, Burslem, Tunstall, etc. I would then search the British Library’s catalogue to look for newspapers covering this area. Enter the town, city, or county, and click search. This will bring up a list of results. In the left hand column, click ”Created before 1920”. The titles of newspapers change dramatically, so it is best to search by county. From their titles and information, you will be able to find the relevant newspapers. You can either order the newspapers to the British Library’s reading rooms in London or Boston Spa. Check to see if they have been digitized to view online, or see if they are available to view at a local library. The following letter was written by Private Philip Clayton, Nottinghamshire Sherwood Rangers Yeomanry, on 01 June 1915 at Abbassia Barracks, Cairo, Egypt. Clayton sent the letter to his former headmaster and it was published in the Hull Daily Mail on 01 July 1915. It is an excellent example of the type of information you can find through letters published in local newspapers. About our journey here. We had a very good voyage. The weather was very nice and calm all the way. We embarked on a large transport steamer. She was a splendid sailor, but as a passenger boat, she was very inconvenient and uncomfortable. We had our horses on board, too. We lived fairly well. The ship authorities found our rations. They were rather more liberal than the regular Army contractors. We passed close to Gibraltar, but did not call. We had left Gibraltar about a day’s journey, when we sighted a submarine, but she did not attack us, as was reported in the papers. They Wayfarer, a vessel on the same mission as we were, was disabled near Queenstown in Ireland. They, with true British heroism and coolness, acted nobly, and under the able command of the colonel of the regiment were landed safely. I salute the Warwickshire Yeomanry, and am proud to be in the same division. We stayed near the docks for two days, during which time we saw three shiploads of our Indian troops. They looked a desperate lot, and yet they are very friendly among themselves, and especially with we English. They would shake our hands and say ”English soldier! Good!”. They offered us supper, which, I may tell you, we refused. Their methods of cooking are too pre-historic for use to enjoy a meal of their making. They have a stone bowl and mix some dirty looking flour with water, and then take it in their hands and squeeze it, similar to children making clay models. I must say they are very cute at their work. Several of them carried Bowie knives on their belts. They do look desperate with those knives in their hands. Their bayonets are much longer than outs, and would go straight through a man. They dress pretty nearly as we do, with the exception of headgear. They all wear turbans, whereas we wear pith helmets. We left the docks and went about eight miles further out to a camp named Sibibish. This was close to the sea, and very pleasant, although the sand got in our tea and all our meals. The water was good and plentiful. We marched right through town, and an interesting time it was for us. The ever-changing scenes as we passed the picturesque natives with their peculiar cries and more peculiar dress. Their long robes and bare feet, in some cases bedecked with rings and anklets, and others of the working class with just a robe over them for decency’s sake. We passed on through the town to the suburbs. No scenery in England can compare with it. The lovely green of the trees and the brilliant flowers that grow in such abundance all make as seen that for four miles is the finest I’ve ever seen. To go on with our journey. We came at length to our camp. It was midday, and we got the full heat of the sun on us, that was more keen than ever because of the attraction the sane seems to have for it. We only stayed there a fortnight, as it was killing us all slowly with dysentery. So we came to Cairo into barracks. You can have no idea of the size of them. They are colossal buildings, and there is a wall front three miles long and then the stables and riding schools, hospitals, soldiers’ homes, chapels, cinemas and institutes to say nothing of the shops that we have in the barracks. We can buy practically anything we want without going out of barracks. We must have a pass to go into Cairo; we are granted one every four nights if we desire one. The city of Cairo is a wonderful place. The buildings are wonderful constructions, and have some of the finest work that I’ve ever seen. To speak of the morals of the city, to put it shortly, there are none. Its utter disregard for any morality is awful, as is chiefly the case in eastern cities. We are eight miles from the Sphinx and can go for 10d return on the trams. It is worth the money to have the journey alone, without seeing the Sphinx and pyramids. They are without doubt one of the seven wonders. How in the medieval days they built such a wonderful structure as the pyramids. The stones themselves each weigh several tons, and they are placed as high as 400 feet and no electric cranes in those days. Then on the way to the Sphinx from Cairo is the finest Zoo in the world. There are plenty of places of interest and amusement in the town, but very little English. It is mostly Oriental, but a good deal of French, especially the singing and music at the theatres. The tram service in Cairo is very good. One can travel from our barracks in Cairo for less than one halfpenny, and it is four miles away, and very decent trams too. There are some of the finest shops in the world in Cairo – one draper’s shop in particular was marvellous. The Australians have been stationed here and caused quite a sensation. We British soldiers as privates get 1s 2d per day. The Colonials get – Canada 4s 5d. Australia 6s, New Zealand 5s. That is a slight difference isn’t it. Why, I don’t know. I hear this morning of the air raid on London. The Germans seem to have a certain amount of pluck, despite our assertions to the contrary. Luckily the damage is small. We don’t see aeroplanes out here. We see camel corps and mule trains and such like out here. The Egyptian Army are a fine body of men. I don’t see why some of them could not be sent to the Dardanelles, as it is in their country’s interest to subdue the Turk. The Sultan of Egypt’s brother lives about a quarter of a mile from our barracks. He has a grand residence, and seems to have a good deal of influence in Cairo.